We’re thinking of going vegan, or at the very least becoming more serious about doing the “vegan before 6” plan that Mark Bittman describes in Food Matters. But I don’t want us to be lazy about it — what the Vegan Freak Radio folks rightly deride as “potato chip vegans.” A big part of what I want to do is make smarter choices about food in general, and to make a greater effort to put vegetables at the heart of our diet. So I’ve been looking at vegan cookbooks, not just to get new recipes but to learn what some of the principles are for things like baking. Or at least that was the plan; I haven’t got very far in the cookbook canvass and so I haven’t really gotten a full understanding of what you do in place of eggs. 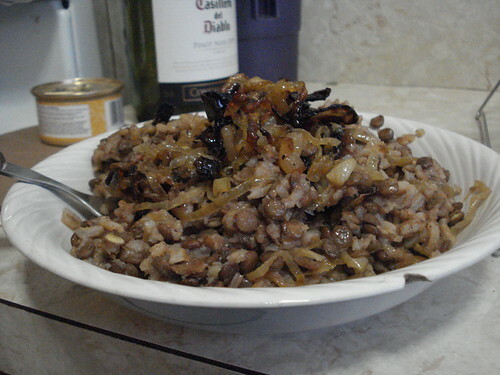 I got sidetracked in Veganomicon by a blast from my past: lentils and rice with caramelized onions, which I knew as Mujadarah when I was in grad school in Cleveland and spending too much money at Aladdin’s on Cedar. I usually pride myself on trying new dishes when I eat out, on not getting into a rut and always eating the same thing, but I could never resist the crispy toasted onions and the hearty lentils and rice. So I had to make it for myself. It’s not at all difficult but it does require a bit of time from start to finish. 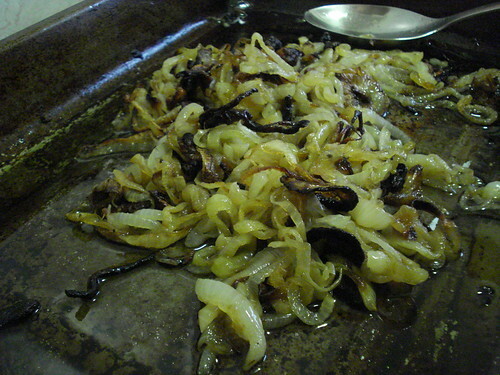 I began by weighing onions, as the recipe called for 2 pounds. I sliced these into thin rings and put them into a baking pan, and then tossed them with olive oil (the recipe calls for 3/4 of a cup and I followed it but I think that was too much; I’ll use half a cup next time). I set them roasting in a 400-degree oven. They were supposed to take 25-30 minutes to get crispy and caramelized, but I had to turn up the heat partway through and add a good half hour to the cooking time before I was satisfied. I think our oven runs a little cool, and it’s a more pronounced difference at the higher end of the temperature range. Still, there was plenty of time for the onions to catch up. My next step was to put 4 cups of water on to boil, then rinse a cup of rice and add it to the boiling water along with a stick of cinnamon, some allspice and some ground cloves. (Just how much of those two is not clear; the recipe didn’t list ground cloves in the ingredient list but named it in the instructions, and mentioned allspice twice, so I improvised a bit.) I brought the mixture back to a boil, covered it, and let it simmer 15 minutes, then added a cup of rinsed lentils (I used brown lentils but you could use red, which I will try another time) and some ground cumin, covered the pot and brought it back to boil, and let it cook another 45 minutes. I took it off the heat and let it sit for 10 minutes, then discarded the cinnamon stick and stirred in the caramelized onions. Well, I saved a couple of spoonfuls to lay atop the served-out bowls. 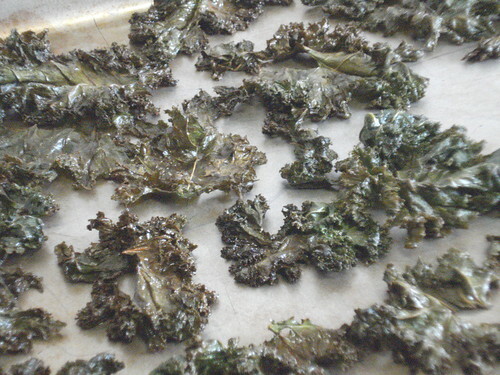 To go with it, I served kale chips. These are child’s play to make, but took a bit of digging to find; the one thing I can report is that none of the vegan cookbooks I currently have from the library includes a recipe for them. I ended up searching the Gluten Free Girl site and using this recipe. 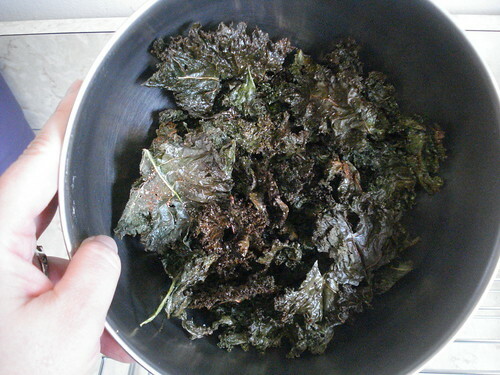 You rinse the kale leaves; I cut out the thick center ribs, which with my bunch made for a lot of small chips, but you could probably trim those ribs down without removing them and end up with larger chips. Anyway, once you’ve dried them well, you toss them with olive oil, spread them on a baking sheet, and bake them at 350 for about 12-14 minutes or until they’re crisp but not browned. (Well, some of mine got a little brown; Shauna warns against that because the browned bits are bitter but I rather like the taste as part of the overall balance.) Then you dust them with a mixture of salt, paprika and garlic powder, and then challenge yourself to have any left by dinnertime. The recipe doesn’t indicate how long they keep; I don’t think it’s an issue. You probably won’t have any left by the end of the day. Anyway, we served up the Mujadarah with kale chips, which were a fine complement; the spicy salt balanced the heartiness of the lentil and rice dish. One bite and I was transported back to grad school and Cleveland Heights. It’s not a picturesque dish, but it’s delicious: hearty and spicy and comforting. It’s terrific cold, too. It’s muggy and warm in my home office as I sit typing, so it’s hard for me to believe that summer may finally be drawing to a close. I’m not nostalgic and weepy about it. I cannot wait for the cooler weather. I live for autumn. Yes, even last autumn, which was one of the hardest seasons I’ve ever faced in my life, was still glorious for its weather. The crisp tang in the air as the fall breezes undercut summer’s heat. The turning of the leaves. So far the only sign I’m seeing is that the sun is setting noticeably earlier. It’s grayer now than it was last week at this time. Granted, part of the reason is that the skies are overcast. The forecast has been threatening, or perhaps promising, rain for hours now, but it keeps refusing to come. The air remains dense and warm, and my husband cannot stop sneezing. I don’t know what pollens Hurricane Irene washed up here last week but it’s high time they went away again. The selection at the neighborhood Greenmarket this past Saturday had changed, but I think that was less a function of the coming fall and more a result of the devastation the hurricane wrought upstate and in New Jersey. Many farms lost all their crops; anything topped by floodwater was automatically deemed unfit for consumption. Plants were damaged or killed, limiting the amount of new growth and harvest. The stalls on Saturday had a much slimmer selection than usual (granted, I didn’t arrive until closer to 1 pm, so the earlier risers may have had more to choose from). Still, I found enough to meet our needs for the coming week: tomatoes, eggplant, cilantro, bell peppers. I looked last for fruit and found peaches, $1 per pound, and not looking bad. I loaded a bag, and thought. You can’t exactly stock up on peaches; they go bad too fast. Their rich sweetness is their undoing. But then I thought, I haven’t made ice cream all summer, and peach sorbet may be just the thing. I adapted a recipe from the booklet that came with the ice cream maker. The recipe was actually for strawberry sorbet, but I assumed the proportions were basically sound: 3 pounds of chopped fruit, 3 cups of water and 1 1/2 cups of sugar cooked into a syrup, 3 tablespoons lemon juice. As I was measuring the sugar for the syrup I wondered if the fact that peaches have a more unalloyed sweetness than strawberries might result in a too-sugary dessert. This gave me the bright idea to slice a couple of rounds of ginger root into the pan to infuse into the syrup. Making the syrup is simple: you bring the water and sugar (and ginger) to a boil and let it simmer a bit. The recipe says “until the sugar is dissolved,” but I had stirred well and the sugar was dissolved before the mixture came near the boiling point, so I let it bubble gently for about 5 minutes while I finished the dishes. Then I set it aside to cool. 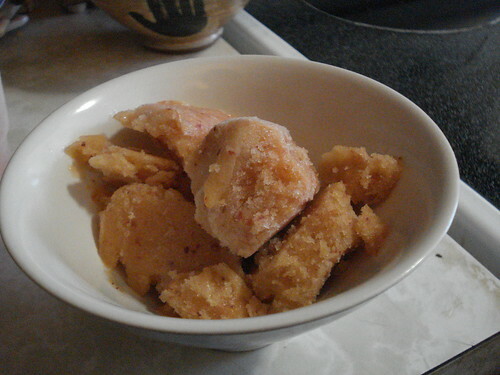 When it was cool enough to work with, I chopped peaches, peeling off the thickest of the skin but mostly leaving it in place, then pureed the chunks. I put everything into the ice cream maker canister and stirred well, then set it churning. 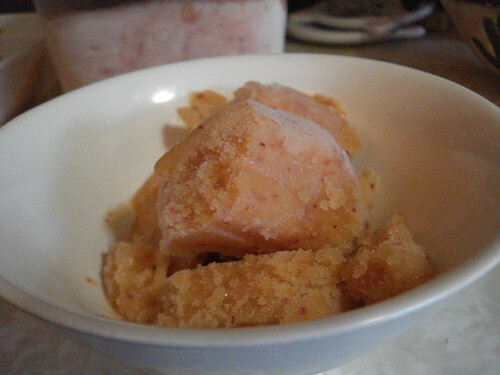 And, voila: ginger peach sorbet. It’s very refreshing. The ginger isn’t strong–just a hint that takes off the sugary edge and lets the full flavor of the peaches shine through. A fitting end to summer indeed. Now if it would just rain already.